This is a cross post from the News and Updates blog. This week marked a major step forward in the transformation of the Giant Ocean Tank. The animals are coming home! 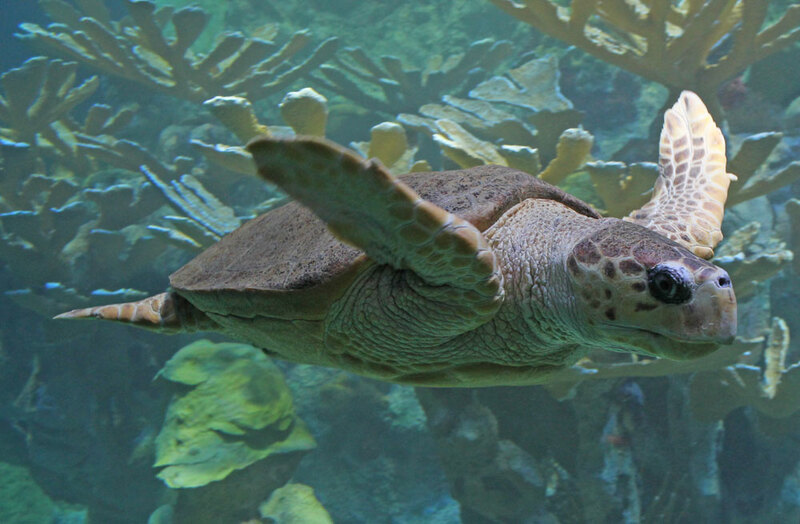 Carolina and Retread—two loggerhead sea turtles—were the very first of nearly 2,000 to make the move. Follow along on their journey from the temporary exhibit to their new home. So, what has changed about the Giant Ocean Tank? The complex coral sculptures you see inside are completely new and will provide safe homes for more than twice the number of fishes that lived in the tank before. There are also new crystal-clear viewing windows. The top of the exhibit will reopen on July 1 with expanded presentation and exhibit spaces, a reflective ceiling dome and a ramp providing access for wheelchairs and strollers. Here's more about the scope and features of the project. If turtles smiled, Carolina would be smiling now. Moving the animals is one of the final stages in the Aquarium's top-to-bottom, 21st-century transformation. Over the coming weeks, aquarists will move the animals from the first level temporary exhibit to the big tank. There are even more animals behind the scenes that will be joining Carolina and Retread in this vibrant Caribbean coral reef community. All the animals will be in place and the renovation of surrounding exhibits will be completed by July 1.